Analysis: Grant suffered the season-ending injury Nov. 11 and had surgery a week later, but he denied early reports that the issue was an Achilles rupture. Whatever the case, he's still in the rehab process five months later, presumably hoping to be ready for the start of training camp in late July. The 26-year-old figures to have a role in the return game and could even challenge DeVante Parker for a regular spot in three-wide sets. Grant will undergo season-ending surgery Monday to address the Achilles injury he sustained in the Dolphins' Week 10 loss to the Packers, Adam H. Beasley of the Miami Herald reports. The Dolphins have placed Grant on injured reserve, a league source tells Joe Schad of The Palm Beach Post. Grant (leg) won't require surgery and is considered week-to-week with the expectation that he'll play again this season, Barry Jackson of the Miami Herald reports. Grant (leg) is scheduled for an MRI, Cameron Wolfe of ESPN.com reports. Analysis: Grant entered Sunday's 31-12 loss to Green Bay with a sore Achilles and was carted of the field in the third quarter with a leg injury. He was then spotted in a walking boot after the game, but coach Adam Gase is optimistic the speedy wideout didn't suffer a season-ending injury. A Week 11 bye will give Grant and the other injured Miami players -- including QB Ryan Tannehill (shoulder) and WR DeVante Parker (shoulder) -- some extra time to heal. 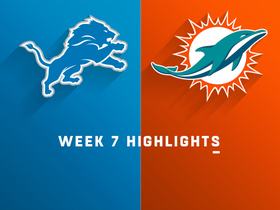 Grant (leg) exited the locker room wearing a walking boot following Sunday's loss to the Packers, Adam Beasley of the Miami Herald reports. Analysis: Grant was forced out of Sunday's contest after pulling up while running a route during the third quarter. The speedster entered the game with a listed Achilles issue, and Sunday's incident might be related to that pre-existing ailment. Grant (leg) was carted of the field in the third quarter of the Dolphins' contest against the Packers on Sunday. Analysis: Prior to his exit from the game, Grant -- who had been dealing with an Achilles issue -- did not haul in his only target. While it's unclear if his Sunday issue is related to that, at first glance, it looks as though the wideout's injury could be serious. 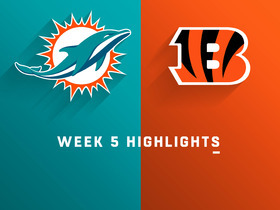 Grant (Achilles) is active for Sunday's game against the Packers, Adam H. Beasley of the Miami Herald reports. Analysis: Grant has been bothered by the Achilles injury for a few weeks, but it has yet to force him to miss any game action. Though the wideout will be available Sunday, he'll likely take a backseat in the Dolphins' passing attack to the likes of Danny Amendola, Kenny Stills and DeVante Parker. Grant played one more snap than Stills did in the Week 9 win over the Jets, but it's worth noting that Stills' workload was likely limited coming off a groin injury. Grant (Achilles), who is listed as questionable for Sunday's game against the Packers, is expected to play, a source told Ian Rapoport of NFL Network. Grant (Achilles) is listed as questionable for Sunday's game at Green Bay, Armando Salguero of the Miami Herald reports. Analysis: Grant's practice reps were capped all week by an Achilles injury, an issue that could rear its head on the field at some point in the second half of the season. For the time being, though, he has a chance to suit up Sunday afternoon, which will be revealed approximately 90 minutes before the 4:25 PM ET kickoff. If he's deemed available to the Dolphins offense, Grant will be a fringe option in the passing game behind fellow wideouts DeVante Parker, Kenny Stills and Danny Amendola. Grant (Achilles) was a limited participant in Thursday's practice, Armando Salguero of the Miami Herald reports. Grant (Achilles) was a limited practice participant Wednesday, Armando Salguero of the Miami Herald reports. Analysis: Grant may have picked up the injury during Sunday's 13-6 win over the Jets, but it probably wasn't as big of a factor as the return of Kenny Stills (groin). With DeVante Parker and Danny Amendola also primed for key roles, Grant lines up as the likely No. 4 receiver for Sunday's game at Green Bay, though he could bump up to No. 3 if Stills runs into issues with the groin injury. There hasn't been any indication Grant's Achilles' tendon injury is a major concern. 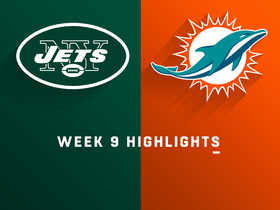 Grant brought in one of two targets for 16 yards during Sunday's 13-6 win over the Jets. 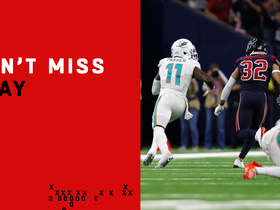 Analysis: Grant was held to one catch in what was a quiet day for Miami's passing attack, with quarterback Brock Osweiler having been held to only 139 yards without a touchdown. 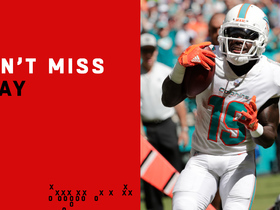 Though Grant's big-play ability always remains a factor, the Dolphins' passing game has not been consistent enough in recent weeks to enable fantasy relevance. The third-year pro will look to showcase his elite speed and bounce back against the Packers on Sunday. 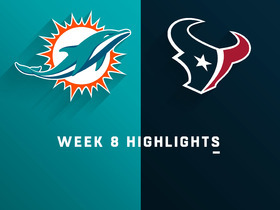 Watch complete highlights from the Week 8 match up between the Miami Dolphins and the Houston Texans. 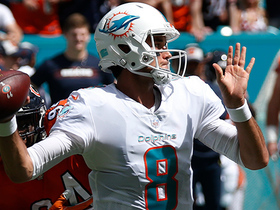 Miami Dolphins quarterback Brock Osweiler passes to Jakeem Grant for 16 yards. 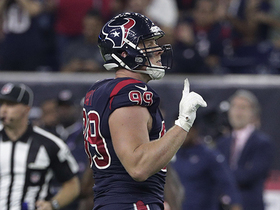 Houston Texans defensive end J.J. Watt bats down a pass thrown by Miami Dolphins quarterback Brock Osweiler. 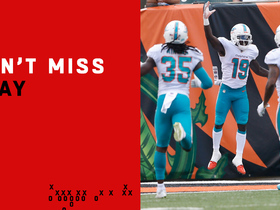 Miami Dolphins QB Brock Osweiler throws a dart to wide receiver Jakeem Grant for a big 25-yard catch and run. 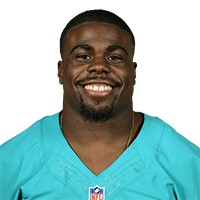 Miami Dolphins wide receiver Jakeem Grant takes punt return to the house for a 70-yard touchdown run. 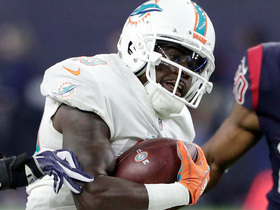 Miami Dolphins quarterback Albert Wilson takes the hand off and finds wide receiver Jakeem Grant who works his way 52 yards down field for a touchdown.